The blobs first appeared in the spring of 2013. They were roundly amorphous, like cookie dough plopped onto a baking sheet. Their faces, a rainbow of emotions, had mouths that turned up and down in imprecise dashes. For years, the blobs sat on the keyboards of Android phones and Google Hangouts as the goofy counterparts to Apple's more lifelike emoji. And in that time, they amassed both haters and loyal acolytes. Now, though, that debate is over. As part of its Android Oreo update, Google replaced the blob with symmetrical circles and more human-like figures. The update marks the biggest change Google’s made to its emoji in years. But it didn’t happen overnight. Emoji—like so many of the objects they’re designed to represent—evolve. Transforming the blob’s shape, color, and meaning, was a lengthy process that started, arguably, the moment Google’s blob emoji was born. When Google designed the blobs nearly half a decade ago, the emoji landscape had already begun to coalesce around the perfectly round circles seen on iOS. Android emoji, by comparison, were delightfully kooky. “I had a Japanese code name for them: ponyon,” says Satoe Haile, a designer at Google who, along with the contracted Japanese design firm IC4, helped conceptualize the blob. Ponyon roughly translates to the “sound of something bouncing,” which aptly described the emoji’s jubilant, non-human form. The designers intentionally illustrated the blobs so they would be lighthearted and expressive, even when their faces were grumpy or sad. “We wanted to create something cute,” Haile says. At the time, this winking attitude made sense. It was 2013, and emoji weren’t the loaded graphics they are today. It would be another year before emoji would show up in an official White House economic report; two years before  would become the Oxford dictionary’s word of the year. That made the blob's unique design a problem for communicating across platforms. There was no guarantee that the emoji you sent to your friend from your Nexus 7 would be the same emoji they’d see on their iPhone, and vice versa. For a while, the  on iOS turned into a pink, hairy heart on Android. Something had to change. Google designers began tweaking the blob emoji in subtle ways. First, Google made the features in their expressions clearer and more pronounced. Then, in 2015, it unified the blob into a single gumdrop silhouette and reoriented every emoji so they faced directly forward. “We tried to make the expressions more orthographic so there was no confusion or conflation with direction," says Rachel Been, a creative director at Google. Because emoji are purely graphical, any visual decision can be misinterpreted; a blob leaning to the left could mean something entirely different than one standing upright. At the same time, Unicode started to push for more realism and representation in emoji. Debates around emoji gender and skin tone proved complicated for Google, whose yellow blobs were intentionally neutral. “If you want to do skin tones, it would look pretty weird to do them on blobs,” says Jeremy Burge, founder of Emojipedia and a member of Unicode’s emoji subcommittee. In a 2016 update, Google introduced human figures and optional skin tones—an important first step. But these more realistic emoji still lived alongside the blobby expressions. To many people within Google, there was a clear discordance between the two, and so the company started to reconsider the blob’s place in its set of emoji. “At no point in time did someone storm into a room and say the blobs must go,” Fonts recalls. Like most big corporations, Google moves slowly. Transitioning away from the blob took nearly two years of meetings, design sprints, and endless iterations, until the squishy circle landed on your phone today. 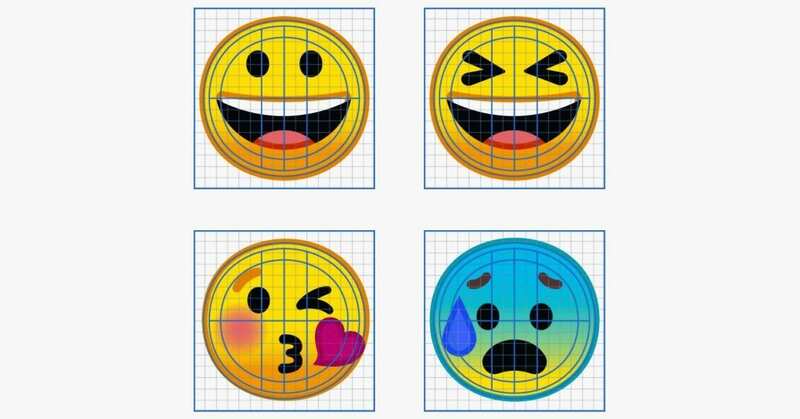 From the start, Been and her team of designers knew they wanted to build every emoji on a simple grid. This allowed them to swap reusable parts—like eyes and mouth styles—consistently and quickly between different emoji. Unlike Apple, whose emoji have progressively gotten more realistic and dimensional with every update, Google opted to retain the flatness of the blobs. They created a base color palette that’s loosely connected to Material Design, the company-wide design language, and added a slight outline around each emoji to ensure they stood out against different colored backgrounds. This visual minutia might seem inconsequential, but Google developed its system from the ground up to ensure future designers will be able to easily update the emoji as they change. “Thirty years down the line when we still have emoji, we’re not going to have the same designers making the set,” Been says. And the emoji designs will change. Phone screens will improve, and illustrations will eventually look outdated. Meanwhile, emoji's meaning, like words, will evolve with culture, just as it's always done. Four years ago, the blob felt right. Today, it's the squishy circle. In the future, who knows? But chances are good that someday down the line, emoji will once again look completely different.